Artist impression: RAN future submarines. Naval Group image. 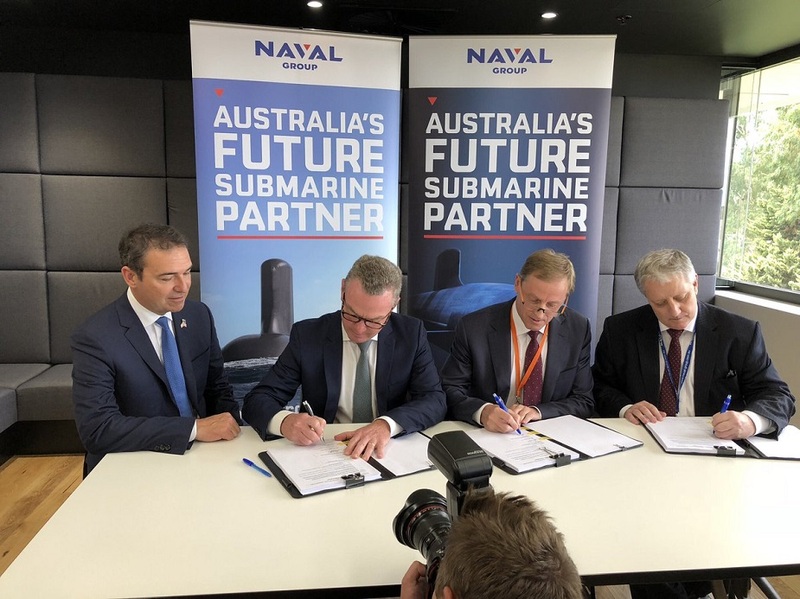 The Australian Government selected Naval Group (then known as DCNS) as its preferred international partner for the design of 12 Future submarines for the Royal Australian Navy. The announcement was made on April 26 2016 by the Australian Prime Minister the Hon. Malcolm Turnbull, the Minister for Defence, Senator the Hon. Marise Payne, The Minister for Industry, Innovation and Science, the Hon. Christopher Pyne and The Chief of Navy, Vice Admiral Tim Barrett. DCNS was competing with the Shortfin Barracuda design against TKMS' Type 216 and Japan's Soryu class designs. 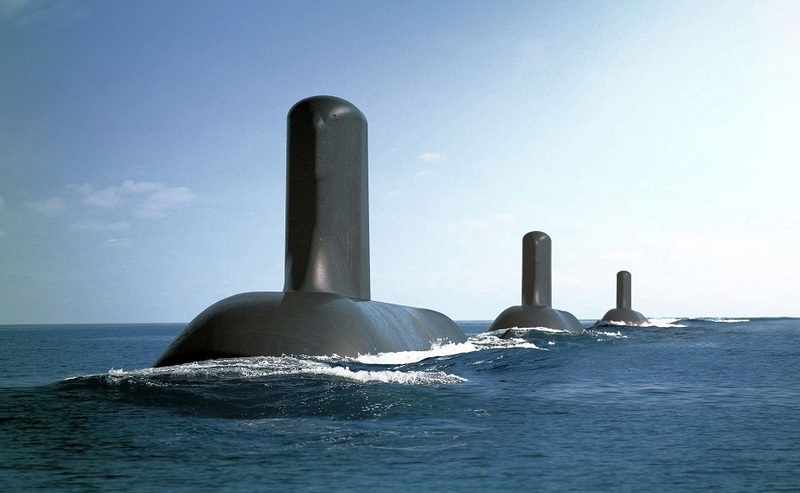 Based on the French Navy Barracuda SSN currently in final stage of construction, Australia's future submarine will be will be 97 meters in length and 8.8 meters in diameter. In September, Lockheed Martin was selected as the preffered combat system integrator. All 12 submarines are expected to be built in Adelaide (South Australia) with technology transfer from Naval Group. 44 highly-skilled Australian engineers and designers have commenced 3D Digital Model courses to develop electricity, structural and outfitting design activities to develop a naval design capability for complex ships. Designers from South Australian companies ASC and Cornell Design, as well as Victorian firm Invenio, will work alongside Navantia Australia employees as part of the program, which will grow Australian Industrial Capability. Navantia Australia will be providing a training program through which trainees will be taught to use the FORAN digital design software. FORAN is a fundamental tool used to create the 3D models and the digital twin, or ship zero, used in design and build phases. Through the use of FORAN, seamlessly integrated into our Business Management System, Navantia Australia is able to reduce costs and improve productivity in the design and construction of vessels. The training program will run over six months. So money was allocated for the shipbuilding college in the budget, and still no word on when it’s all meant to kick off? SEA5000 announcement is set for Friday. Watch this space - will it be cost or capability that wins? BAE Systems beats Spanish and Italian designs for $35 billion warship building program. A British company has been chosen for Australia's largest peace-time warship-building program, under a $35 billion contract to produce nine high-tech, anti-submarine frigates. BAE Systems beat off fierce competition from rival Spanish and Italian designs and will begin construction in Adelaide in 2020. Am so glad that capability won. These will be the most capable ships in the RAN - and extremely effective ASW frigates. Funny that subs and ASW frigates will be built next to each other - basically designed to destroy each other. Does anyone know the industry plan that BAE have for the Future Frigates program? I remember hearing that Fincantieri were going to establish a facility at Osborne to manufacture thrusters and other marine propulsion equipment that would then be exported to their shipyards in the asian region. I also remember that they were planning on establishing a regional maintenance facility that would do repair & refurbishment work on cruise liners. Repair and refurbishment of cruise liners sounds like a pipe dream. I don't think they physically fit as far upriver as the Osborne shipyard. A cruise liner is huge compared to a destroyer or frigate - length, beam, draught. I doubt there is space near the passenger terminal anywhere that could be dredged enough to provide a refurbishment berth, even if it didn't need to be able to be lifted out of the water or dry docked. Most of the cruise ships that come in wouldn't be able to be turned around in the waters where ASC is, they are too long. Ovation of the Seas for example is nearly 350m in length, longer then the width of water from shore to shore. Going a bit further off topic(since we are talking about it, but probably belongs in visions) what they should do is widen the channel, dredge it, and build a cruise terminal just to the north of the expressway/rail bridges. Would add extra impetus to move the heavy industry just to the west of that site out of the area, and generally clean up the wider area. With all the talk of Naval Group (DCNS) and the Federal Government seemingly not being able to come to an agreement on the Future Submarines Program, it seems the Japanese have announced if the deal falls through that they would be willing to take over the contact and not only build the future submarines at Osborne, but also use ASC to build submarines for the Japanese Navy. IMHO although there might be a slightly longer wait until commencement of construction, this seems like a much better deal as the Soryu Class submarines that the Japanese were proposing are considered to be among the best if not the best diesel-electric submarines in the world. The problem with the Japanese option was that they weren't willing to share all the technologies with our navy. That would hamper our navy's operations and capabilities. We should have gone and still should go for the American Virginia Class, or an evolved design. It's interesting that ASC keeps laying experienced workers off, but a few months ago was hiring new apprentices. That would also mean either building a nuclear supply chain in Australia, or sending our boats to the US to refuel them. The nuclear reactors on subs don't need refueling for a long, long time. They'd probably see the end of their life cycle before needing refueling. And true, we have an abundance of resources both natural and human in this country, we could be self sufficient in a lot of areas, but our governments signed us up for globalization instead so we aren't. Personally though I think our best option is to piggy back onto the Americans, our closest and most important ally. They have the biggest budget for r&d in the world, and are decades ahead in many areas especially when it comes to defence/military. Some may say the US is well ahead in defence technology and development - but I often wonder how much is propoganda versus reality. My biggest thought about the whole thing is more that I feel submarines and surface ships appear to be totally ready for "disruption" and that lethal, mass manufactured drones will very soon render them redundant....I remember reading a while back about the US already trialling drone mini-subs - and no doubt in a short timeframe there will be networked mini-nuclear drone subs prowling the ocean 24/7 and never needing to surface and armed to the teeth.